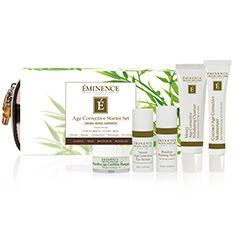 Eminence Starter Sets are the perfect gift for Mom this Mother’s Day! Each kit includes about a month’s supply of everything Mom needs to start her Organic Skin Care routine. 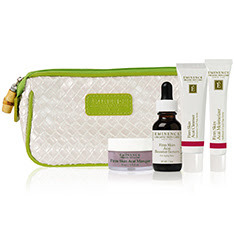 These starter sets also Bonus as a Travel Kit as well with their own complementary Travel Bags with each Starter Set. Reduce signs of aging with the complete Age Corrective skin care routine. Addresses aging with ingredients such as Monoi, Coconut, Neroli, and Bamboo. This Natural Retinol Alternative is specially formulated from Chicory Root and Tara Tree Gum to immediately boost collagen to lift and tighten your skin. Phytocelltec Swiss Green Apple stem cell concentrate maintains skin’s elasticity. 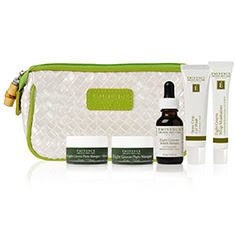 Target hormonal acne and aging with this antioxidant-rich starter set. Normalize oil production, prevent breakouts and revitalize aging skin with the power of supercharged greens. Yucca Extract supplies phytoestrogens. Flaxseed & Linseed provides Omega 3 to heal and protect. Horsetail calms inflammation, softens and supplies Silia to your skin. Lavender promotes restoration of the skin and works as an anti-irritant. Paprika increases stimulation and oxygenation of the skin. Red Clover reduces inflammation and acne. Stone Crop reduces inflammation, regenerates, lightens & moisturizes your skin. Reverse Aging with Botanical Hyaluronic Acid derived from Marshmallow Plant that naturally smooths and plumps skin to minimize the appearance of fine lines and wrinkles. Homeostatine from Marine Algae and Tara Tree helps prevent dehydration, reduces wrinkle depth and gives skin the antioxidant protection. Acai Berry, Blueberry, Raspberry, and Seabuckthorn Berry work together to provide the vitamins and nutrients your skin needs to be healthy.